Treatment Philosophy: ​Dr Ashley creates individualized treatment plans utilizing western herbs, homeopathy, nutrition, myofascial release, hydrotherapy, and supplements to help her patients get back to health and well-being. She supports and guides patients in living their most vibrant and vital lives by empowering them with knowledge and tools. Prior to attending the National University of Natural Medicine (NUNM), in Portland, Oregon, Dr. Ashley worked as an educator, organic farmer, and herbalist in the Adirondack Mountains in New York State and in the San Juan Mountains of SW Colorado for over 10 years. 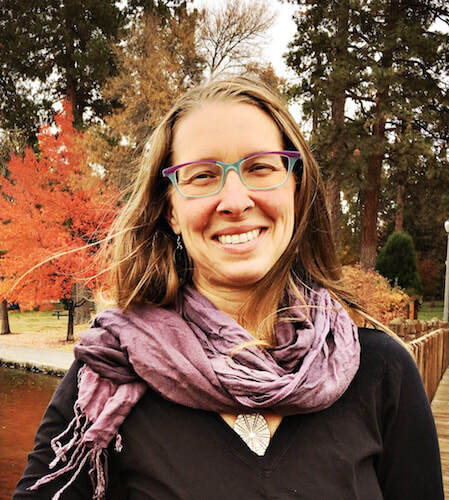 It was in addition to these experiences and her love for the environment, combined with her curiosity for the plant world and all-things-wild that Dr. Ashley came to Naturopathic Medicine. While attending NUNM, Dr. Ashley received her certification from the New England School of Homeopathy (NESH). She also holds a certificate in Myofascial Release and Visceral Manipulation from Moving Mountain Institute. Prior to medical school, Dr. Ashley completed a 3-month residential native medicinal plant internship with United Plant Savers in Ohio and a 10-month herbal and botanical internship with clinical herbalist Elise Krohn. Dr. Ashley also had the distinct honor to study with herbalist and environmental activist Cascade Anderson-Geller in Portland. When she’s not in the office, you can find Dr. Ashley at The Yoga Lab, on a trail with her shepherd/collie mix, Bowie or creating delicious food in her kitchen. She loves all things plants, including identification, wildcrafting, gardening, and medicine making. You can learn with her at her monthly plant meditations at Fettle Botanic Supply & Council.